How Long Do Football Players Have to Practice a Day? When a football team wins a game, the time on the practice field may be the primary reason for the positive performance. Coaches will decide how much time to practice based on the time of the year, the team's recent performance and whether new plays are going to be introduced. 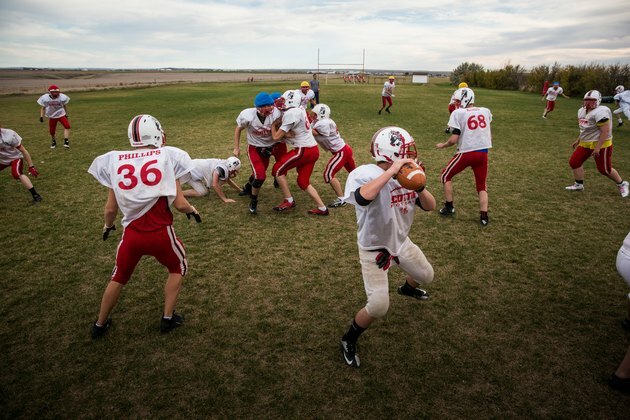 Football teams spend their most time at practice during summer training camp. At the college and pro level, double sessions occur regularly. Teams often practice for 90 minutes during a morning or early afternoon session and then come back and practice for up to two hours in an evening session. Modern coaches are more concerned about practicing in the middle of a summer day than they were generations ago. Former Chicago Bears head coach Lovie Smith would cut practice short in training camp when temperatures exceeded 95 degrees or the humidity was high. Teams often spend two hours on the field at practice during the early season. This is true of football played at the high school, college and professional level. In addition to the two hours on the field, pro players also might spend a similar amount of time going over videotape. Players will study their performances in order to pick out flaws and also study upcoming opponents to learn their tendencies. Coaches at all levels of the game will cut practices at the end of the season. In most cases, players will spend 45 minutes to an hour on the field. Heavy contact drills are all but eliminated at this time of the year, as players work to hone their execution and perform plays with greater ease. Once teams reach the halfway point of the season, coaches are concerned about attrition and losing players through injury. "You don't want to injure your top players in practice," said Hall of Fame coach Marv Levy. "You may need the work but you need your best players to be available." The day before the game, teams at all levels will hold a practice called a walk-through. In this type of practice, players wear shorts and T-shirts and there is no contact. The practice is held in the stadium and players will walk through the majority of the plays that they will try to execute. This practice will last no longer than 45 minutes and is designed to get players used to their surroundings. What are the Benefits of Video Analysis in Sports? Should You Lift Weights Before or After Baseball Practice? What Are the Health Benefits of Being a Football Player?